We are asking for your assistance in identifying potential members for CAUT’s Academic Freedom and Tenure; Collective Bargaining and Economic Benefits; Equity; and Librarians’ and Archivists’ committees. We would appreciate names of CAUT individual affiliated or associate members you feel would be interested and would bring expertise to the work of these committees. For any names you suggest, we must have information about each individual’s appropriateness for the relevant committees. Committee vacancies will also be advertised in the CAUT Bulletin. The CAUT Executive will review all names that have come forward (whether submitted by the candidate or others). It will recommend to Council committee membership that will have the expertise required to fulfill each committee’s functions and will reflect the diversity specified in each committee’s terms of reference (available on the CAUT website). We welcome recommendations of members of marginalized groups. These groups include but are not limited to Aboriginal peoples; women; racialized academic staff; academic staff with disabilities; and lesbian, gay, transgendered, queer and two-spirited academic staff. The final list of members approved by the Executive will be approached to serve and will be advised that their selection will be dependent on the ratification by the CAUT Council at its spring meeting. Members of the Academic Freedom and Tenure Committee should have had considerable involvement in and knowledge about academic freedom. They must be sympathetic to, and have had experience in the defence of academic freedom and tenure, and they should be willing and available to dedicate considerable time to the work of the Committee between meetings, including promotion of academic freedom, drafting of documents, and other related activities. Members of the Collective Bargaining and Economic Benefits Committee should have demonstrated experience in collective bargaining. They should be able to commit time between meetings to the work of the committee, including drafting of model clauses, development of policy statements and other related activities. Six of the eight members of the Contract Academic Staff Committee are from the six CAUT member associations with the largest CAS membership. The other two are a representative from small associations and a representative from medium-size associations. Both those positions are filled until 2015. The composition of the Equity Committee is to be the two-co-chairs and two members from each of the following groups: Aboriginal academic staff; academic staff with disabilities; lesbian, gay, bi-sexual, transgendered, queer and two-spirited academic staff; racialized academic staff; and women academic staff. Members of the Equity Committee should have considerable experience in and commitment to the advancement of equity. Members should be willing and available to dedicate significant time between meetings to the work of the Committee, including drafting and editing policy documents, preparing advice for the Executive and Council, and other related activities. Members of the Librarians’ and Archivists’ Committee should have considerable experience and knowledge of the professional interests and academic concerns of librarians and archivists at Canadian post-secondary institutions. They ought to be aware of policy matters pertaining to academic rights and working conditions of academic librarians and archivists. Members should be willing and available to dedicate significant time between meetings to the work of the Committee, including the conference planning, drafting or editing documents, responding to enquiries and other related activities. The term of office for members of standing committees is normally three years, with the possibility of one renewal. Every effort is made to ensure continuity by having terms overlap so that approximately one-third of the committee changes annually. A list of the current members of each of the four committees is attached for your information. On November 29, 2013, the Ministry of Training, Colleges, and Universities Released its Differentiation Policy Framework Analysis FINALThis document is the finalized version of the framework that was leaked in September and then made public on the Ministry’s website. It lays out the principles, components, and metrics that will guide the Ministry’s differentiation policy going forward, and is intended to inform the Strategic Mandate Agreements (SMAs) currently being negotiated by university administrations and the government. OCUFA has completed an analysis of the policy, which you can find attached to this email. Overall, it shows that MTCU has softened its top-down approach to differentiation, and is prepared to let universities chart their own course, with some limits. The policy framework is very high level, and does not contain an “action plan” for government. Crucial areas – such as a new funding model to support the government’s goals – have not been addressed. In discussions with senior MTCU staff, it is clear that an outcomes-based funding formula is favoured, but no model has been developed at this time. The tension between competing goals of the framework, and the confusion within the underlying logic of differentiation remain in this version of the paper. On the one hand, the government insists that one of the central goals of differentiation is to ensure that higher education in Ontario maintains and enhances quality. On the other hand, the entire exercise is proposed against the backdrop of fiscal uncertainty and the pressing need for institutions to contain costs and “financial sustainability and accountability” are presented as a key priority for differentiation. While cost cutting is never explicitly articulated as the overriding motivation, it is clear that the constrained fiscal context is driving the entire differentiation exercise. Cost-containment is often at odds with the imperatives of equitable student access and quality education, so we are concerned that the push towards differentiation may harm the quality and accessibility of higher education in Ontario. OCUFA believes that Ontario’s universities are already highly differentiated. If implemented poorly, the differentiation framework may have the effect of stamping out meaningful, bottom-up diversity and replacing it with limited vision of top-down differentiation. We are also concerned that the movement towards an outcomes-based funding model will harm students studying at institutions deemed by government to be “under-performing.” We are also worried that an outcomes-based model will politicize university funding, aligning it to the short-term priorities of the government of the day, rather than the long-term needs of Ontario. The government has signaled that it is willing to work with stakeholders to achieve its differentiation goals. While they have under-delivered on this promise up to this point, OCUFA is prepared to work with MTCU to ensure that faculty interests are fairly represented in all policies going forward. If our interests are not reflected in future policy, we will oppose these developments using all of the resources at our disposal. If you have any questions or concerns, please contact me directly at this email or at 416 306 6033. (December 6, 2013) Each year, as we approach December 6, the National Day of Remembrance and Action on Violence Against Women, CAUT and its members reflect upon the past year to identify the gains and losses for Canadian women who experience violence in their lives. This past twelve months we have witnessed our federal government’s continued failure to develop a national action plan to end violence against women in Canada. Despite support at the meeting of provincial ministers this past summer, the Conservative government has yet to agree to launch a national investigation into the missing and murdered Aboriginal women and girls in our country. The Canadian Centre for Policy Alternatives’ report “The Gap in the Gender Gap: Violence Against Women in Canada” examines national and provincial budgets and shows how a lack of investment in strategies to end violence perpetuates the problem and creates additional financial costs more broadly. Responding to similar concerns, the Canadian Network of Women’s Shelters and Transition Houses have launched Canada’s first national shelter data count project to provide a ‘snapshot’ of life in a shelter on a “typical” day. The results of the data count will be fed into the Global Shelter Data Count to help situate Canada internationally. The Canadian Labour Congress (CLC) in partnership with the University of Western Ontario’s Centre for Research & Education on Violence against Women & Children (CREVAWC) is launching the first nation-wide survey on the impact of domestic violence on workers and workplaces, the results of which will help unions, employers, advocates and governments develop good public policy as well as provide essential data to support the labour movement’s work at the bargaining table. Disturbingly, we have seen in the past year the rise of misogynist men’s rights groups on campuses and in communities across the country – an alarming trend that requires our attention and action. At the CAUT Council meeting last week, a motion was passed that CAUT commission a report to study the nature and impact of male rights groups across Canadian universities and colleges and take appropriate action to implement the Commission’s recommendations. On December 6, CAUT encourages all its member associations to support projects and community actions that work towards ending violence against women and girls, and to actively participate in efforts to eliminate gender-based violence on our campuses. A tentative agreement for the CAS Bargaining Unit was reached during mediation late this afternoon. Notification of a ratification meeting and the voting procedure will be sent to you shortly. We cannot disclose details of the tentative agreement until the ratification meeting. According to the Memorandum of Agreement signed with the employer, the details of the CAS tentative agreement cannot be disclosed by either Party until they are presented at a bargaining unit meeting. This is standard procedure in labour negotiations. As in the past, the ratification vote will begin at the meeting and will continue for 3 to 4 days at both campuses. A summary of the agreement will be available at each voting station but will not be distributed. 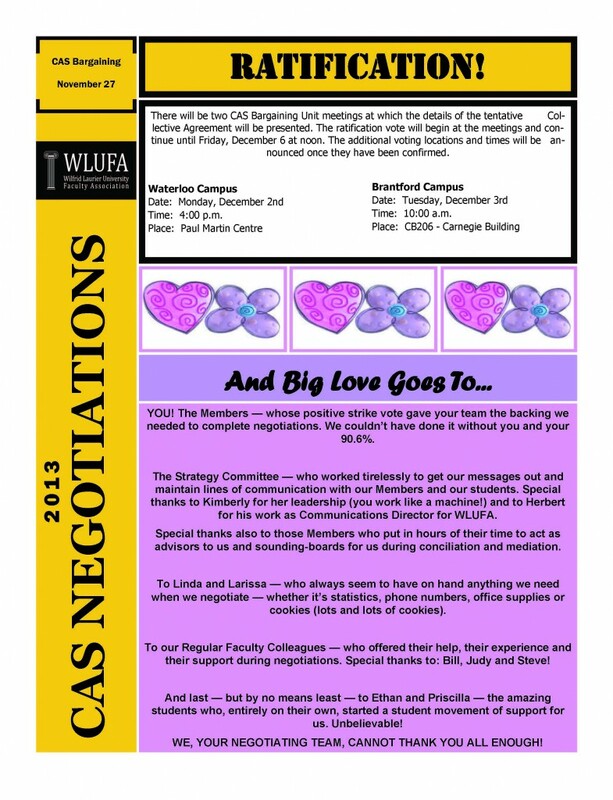 The University Administration has asked WLUFA to agree to mediation in regard to renewing the CAS Collective Agreement. WLUFA has agreed. A tentative mediation date has been set for Tuesday, November 26, 2013. Attached is the 2014 Application package for this prestigious OCUFA award. Information on past awardees can be found under the “awards” section on the OCUFA website. Please encourage your graduate students to look into applying. 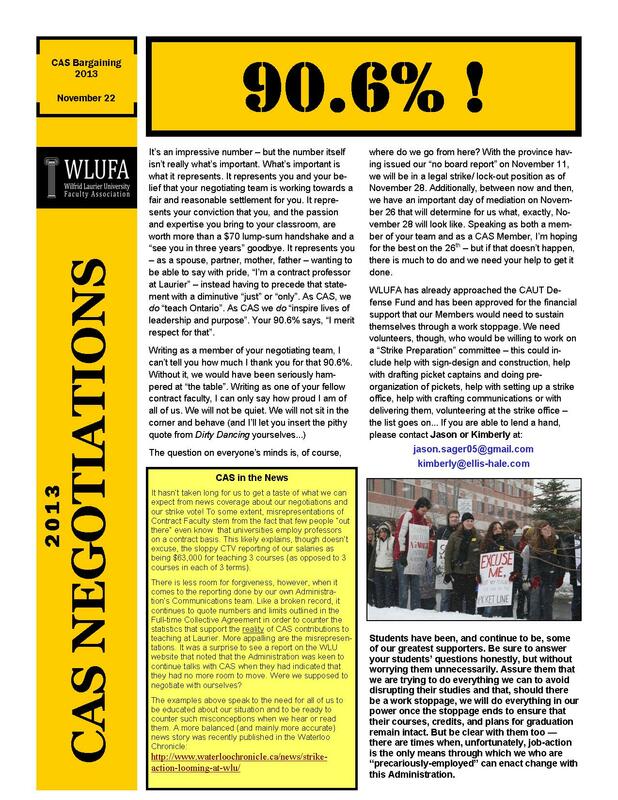 On Thursday afternoon, 7 November 2013, WLUFA requested a ‘No Board Report’ from the Ontario Ministry of Labour after two full days of conciliation with the provincially-appointed conciliator. At the end of the second day of conciliation, Monday 4 November 2013, it was made clear to the CAS Negotiating Team that, despite our attempts to accommodate its demands, the Administration was refusing to move from an unacceptable offer and conciliation was at an impasse. This left us with no choice but to request a “No-Board report”. The CAS Negotiating Team brought forward the recommendation to the WLUFA Executive on Thursday morning. The Executive voted in favour of requesting a “No-Board report” from the Ministry. WLUFA is committed to ensuring that CAS faculty are fairly compensated for the responsibility of delivering half of Laurier students’ educational experience in the classroom. 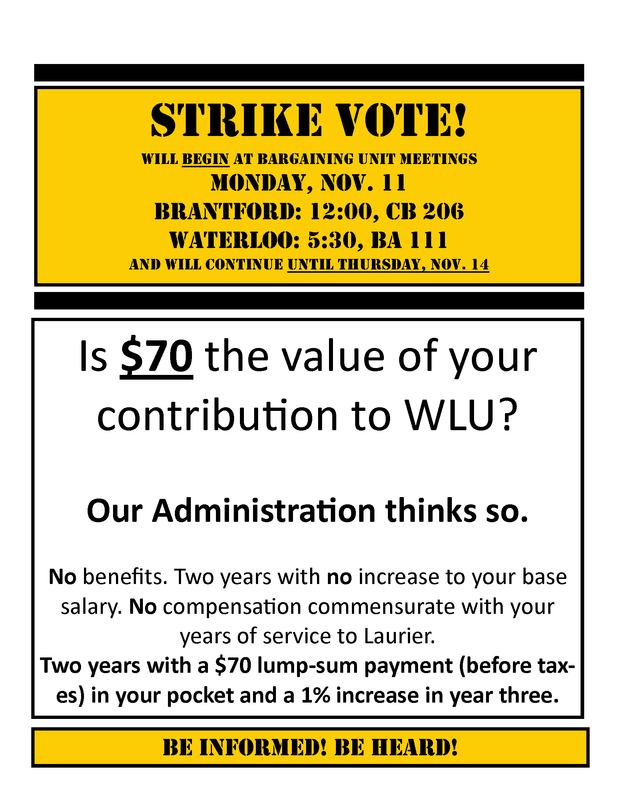 There will be Bargaining Unit meetings on Monday, November 11. It is very important to have your input. Please attend one of the following meetings. 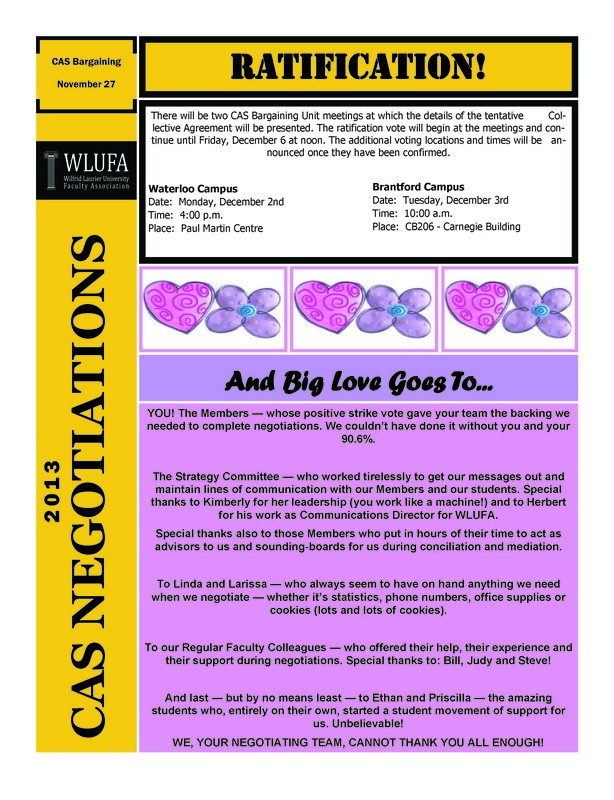 WLUFA will communicate regularly to update members and students about the state of negotiations and would ask that you check out our different channels for updates: www.wlufa.ca, https://www.facebook.com/groups/wlufacas/, weteachlaurier.tumblr.com, advocatewlufa.wordpress.com, and @WLUFA on Twitter.